Unlike some changes in digital marketing, RWD (Responsive Web Design) is far from last year’s news! Responsive design reformats your website pages based on the mobile device that your visitors are using. So, whether the user is viewing your website on a tablet, mobile phone, or desktop, the page will reformat itself for that specific device. Now that’s cool!! What a leap in technology in the web industry. In the past, you would have created a separate mobile site or a dynamically served mobile site to accommodate for the changes. Although there are noticeable advantages from a SERP (Search Engine Results Page) perspective, let’s focus on you as a business leader and how you will benefit from this change. 1. Your customers are mobile already! Stay in front of their eyes. Have you checked your analytics account for mobile traffic lately? If you do, I can assure you that there is an increased percentage of your visitors browsing your site on a mobile device (some of my clients are seeing an increase of 175%). Although being responsive has many advantages, the most important aspect from a business perspective is that you will be able to stay in touch with your customers and engage with them at every possible opportunity. 2. Competitors, Competitors, Competitors! Did I mention your Competitors? We all know how important it is to stay ahead of your competition to survive in the online world. The fact of the matter is that responsive design is becoming a standard in the industry so you need it to keep up with your competition. Or if your competitors have not implemented a responsive design, this is your opportunity to get ahead of the game. Key Take Away: If you’re not offering a responsive design to your customers your competition probably already is. According to observations and a statistical study like this one, the web’s future is definitely mobile. 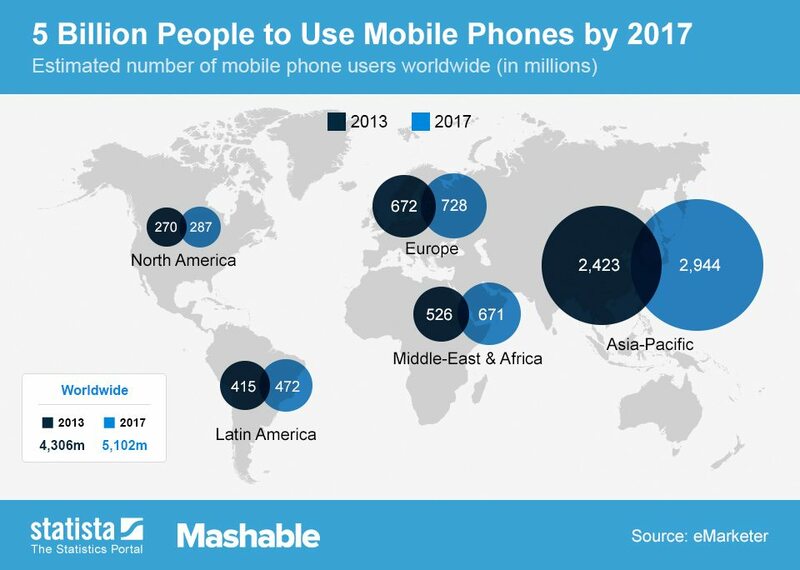 The chart below shows how it is estimated that more than 5 billion people will use mobile phones by 2017. Predictions of this study should not be ignored. A responsive site can help your business, and if you’re not convinced of that, you will be in a few short years. Key Take Away: How much more information do you need to be convinced that responsive is the way of the future. Most of you are probably reading this blog on your phone right now! RWD makes your website mobile friendly to your users which makes it much easier to find and read content that they are looking for as well as increase mobile interaction. It just makes sense this day in age to embrace RWD! If you’re wondering how your website displays across various devices check this out.